Sam & Dave's Brass Extravaganza! The ever-exciting duo of trombone and tuba has found a new voice in Sam & Dave’s Brass Extravaganza. Flying out of the cannon, The Extravaganza’s current season, titled The Devil's in the Details, includes an interactive program of acrobatic music for the trombone and tuba with electronic media built around a devilish theme! Sam & Dave’s Brass Extravaganza has toured and taught extensively throughout the United States, and concluded their 2016-17 season with performances and masterclasses in Germany. -Images from the Dark: La Grotte Cosquer – this eerie work for the low instruments explores the fantastical and hidden world of an undersea cave. What hidden mysteries and dark images are waiting within this work by Norman Bolter? -A Howl in the Night: Blue Wolf – Brad Edward’s contemplative work for solo trombone was inspired by Joni Mitchell’s song, The Wolf that Lives in Lindsey. You will hear howls, barks, growls, and some lighter moments that allude to the Nickelodeon children’s show, Blue’s Clues. -A Monstrous Growl: The Grumpy Troll – an aggressive work for the solo tuba evoking the grumblings and roars of a grumpy, monstrous troll. The composer and tubist Mike Forbes wrote this adventure into a Norwegian troll’s temper tantrum. -The Ring of Fire: Dante’s Inferno – a vibrant video sonata exploring the classic text by Alighieri and composed by Stephen Rush. Join us on a journey through the dark and macabre underworld! 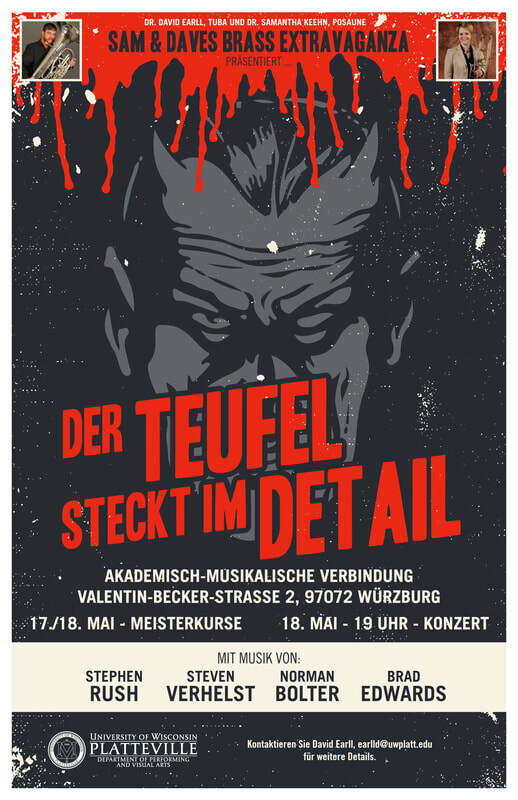 See us in our upcoming performance/masterclass tour in Germany, and look for more information on our upcoming season performances! 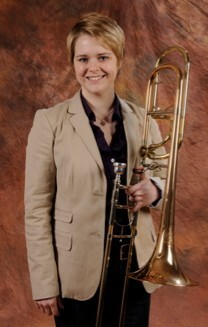 Samantha Keehn is the Low Brass Professor at Augustana College in Rock Island, Illinois. Samantha currently performers with the Augustana College Faculty Brass Quintet, is acting principal trombonist with the Muscatine Symphony Orchestra and is looking forward to performing a concerto with the Clinton Symphony Orchestra next season. Samantha holds her D.M.A. in Trombone Performance and Pedagogy from the University of Colorado at Boulder where she studied with Dr. William Stanley. A native of Victoria, TX, she also attended Texas Tech University (B.M.) studying with Don Lucas, and Baylor University (M.M.) where she studied with Brent Phillips. She has won numerous awards and grants including the Bronze Medal of the Senior Wind Division of the esteemed Fischoff Chamber Music Competition. Samantha has performed and presented at ATW (formerly ETW), ITA, TMEA, the Big XII Trombone Workshop, ITEC, MTC, Tubonium and IWBC. As a researcher, Samantha focuses on creative studies and has a method and etude book published by Mountain Peak Music called Beyond the Notes and Rhythms: A Practical Approach to Teaching Musical Expression. For more information please visit Samantha’s website at www.keehnbrass.com. 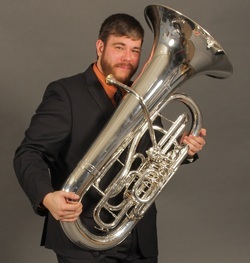 Dr. David Earll is a Willson Tuba Artist and teaches Tuba, Euphonium, and Trombone at the University of Wisconsin-Platteville. David currently performs with the vibrant UW-Platteville faculty chamber group Ensemble Nouveau and has also performed with the Dubuque Symphony Orchestra, the University of South Dakota Faculty Brass Quintet, and the Boston-based Nautilus Brass Quintet. David completed his Doctorate of Musical Arts in Tuba Performance at Arizona State University under the tutelage of Dr. Deanna Swoboda. He also holds a Master of Music in Tuba Performance from Arizona State University, where he served as a Teaching Assistant for Professor Sam Pilafian, and a Bachelor of Music in Music Performance at the University of South Dakota. David is in demand as a performer and clinician both throughout the United States and internationally. Dr. Earll most recently performed a solo tuba recital/masterclass tour in The Netherlands, Germany, Austria, and Switzerland and also recently performed as a soloist and clinician in Hong Kong. David performs exclusively on the Willson 3200 F Tuba and the Willson 3050 CC Tuba. For more information please visit David’s website at www.davidearll.com. This is Sam's fantastic transcription of Franz Schubert's Erlkonig, now coined "Earllkeehn!" in this arrangement for The Extravaganza! The centerpiece of our first season, Dante's Inferno by Stephen Rush, is a tour de force for Trombone, Tuba, and Video. This video is from The Extravaganza's performance at the University of Iowa!